little bee books, 9781499805710, 128pp. Behind the Legend looks at creatures and monsters throughout history and analyzes them through a scientific, myth-busting lens, debating whether or not the sightings and evidence provided are adequate proof of their existence. 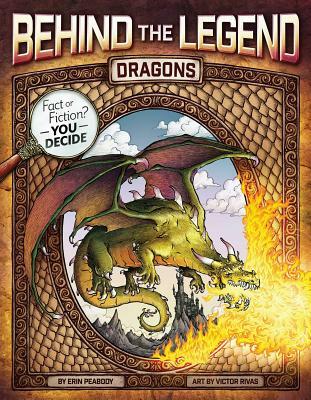 In Dragons, readers learn about all the sightings and "proof" of them, from stories in history of dragons that terrorized towns, the people who fought them, such as St. George, and stories from other cultures, including China, Japan, and Mexico. This book also discusses additional history about the monster, including how dragons became major figures in popular culture, "modern" dragons, and theories behind their conception in our cultural history. Complete with engaging anecdotes, interesting sidebars, and fantastic illustrations, this book is one kids won't want to put down! Victor Rivas was born and raised in Vigo, Spain, and now lives outside of Barcelona. He has been a freelance illustrator for thirty years, illustrating children's and teen books, as well as magazines, posters, covers, advertising, concept art for multimedia games and animation, and comics.